The Village of Grafton, located twenty miles north of Milwaukee in OZAUKEE COUNTY, is centered on the Milwaukee River. 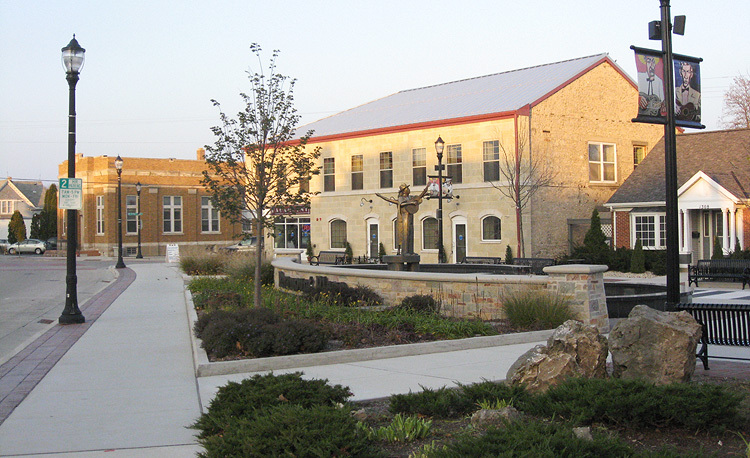 The village is bordered by the City and Town of Cedarburg to the west and the TOWN OF GRAFTON to the east. In 1896, the Village of Grafton was incorporated from the Town of Grafton. When French Jesuits from Green Bay travelled through Grafton in 1670, they found a Native American settlement along the river. Little is known of these early inhabitants. Timothy Wooden, who arrived in 1839 from the eastern United States, is considered Grafton’s first permanent, white resident. Immigrants from Germany and Ireland soon followed. By the 1850s, these immigrant groups made up the bulk of Grafton’s population. German influence was especially strong; originally called Grafton, the area was known as Hamburg in the late 1850s, before briefly becoming Manchester, and finally returning to Grafton in 1862. Grafton’s importance in the region was highlighted by its service as one of a series of WASHINGTON COUNTY seats in the 1840s, before the creation of Ozaukee County. While many early residents were farmers, the Milwaukee River supported local industry. Grafton’s first lime kiln began processing lime from the river shores in 1846. Lime production remained an important part of Grafton’s economy until the 1920s. The river also provided power. The first dam and mill in Grafton began powering the village’s factories and mills in 1849. One of the most famous water-powered factories in Grafton was the Wisconsin Chair Company plant. Originally a furniture producer, this factory manufactured phonograph records under the PARAMOUNT RECORD LABEL from 1917 to 1932. 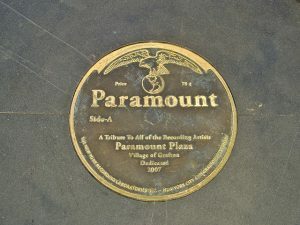 Despite its location in a white community, Paramount was among the chief producers of African-American blues records. From 1929 to the label’s demise in 1932, Paramount brought renowned blues artists from Chicago and the South to record in Grafton. This blues legacy is commemorated in Grafton’s Paramount Plaza. Following the Second World War, Grafton’s population swelled as it took on a suburban character. The construction of Interstate 43, beginning in the 1960s, eased access to Milwaukee. Grafton’s population grew from 1,489 residents in 1950 to over 11,000 in 2010. Residential development accompanied this rapid growth. The majority of Grafton’s current residents live in single-family houses built since 1960. As development expanded in formerly-rural segments of the Towns of Cedarburg and Grafton, many areas were annexed to the Village of Grafton. As recently as 1985, the village comprised 2.8 square miles. By 2010, this number had nearly doubled to 5.06 square miles. The Village of Grafton continues to grow as it accepts annexation requests from residents and developers seeking access to village services. Grafton is home to seventeen public parks and the U.S.S. Liberty Memorial Public Library. The village’s houses of worship include St. Joseph’s Catholic and St. Paul Lutheran churches, which trace their origins to 1849 and 1851, respectively. The Aurora Health Care hospital in Grafton, opened in 2010, is the village’s largest employer. ^ Lions Club, Grafton, Wisconsin: A Story of Industrial Progress (Grafton, WI: Lion’s Club, 1952), 3; Julie Pohlman, ed., 2015-2016 Wisconsin Blue Book (Madison, WI: Wisconsin Legislative Reference Bureau, 2015), 741, accessed October 2015. ^ Lions Club, Grafton, Wisconsin, 2. ^ Donald S. Henning and Ralph L. Zaun, Grafton Wisconsin: A History of the Place and the People (Grafton, WI: Zaun Memorial Foundation, Ltd., 2005), 10, http://digital.library.wisc.edu/1711.dl/WI.OzGrafton. ^ Henning and Zaun, Grafton Wisconsin, 7, 11. ^ Alex van der Tuuk, Angela Mack, and Melissa Schmitz, Paramount Walking Tour: Village of Grafton, Ozaukee County, Wisconsin (Grafton, WI: Historic Preservation Commission, 2008), 3-5, accessed October 2015. ^ Henning and Zaun, Grafton Wisconsin, 22-23. ^ “County Population,” Ozaukee County website, accessed September 22, 2015, accessed October 2015. ^ American Community Survey, “American Fact Finder Physical Housing Characteristics for Occupied Housing Units, Grafton Village, Wisconsin,” (U.S. Census Bureau, 2013), accessed September 22, 2015, http://factfinder.census.gov/faces/tableservices/jsf/pages/productview.xhtml?src=CF. ^ Southeastern Wisconsin Regional Planning Commission, A Park and Open Space Plan for the Village of Grafton, Ozaukee County, Wisconsin (Waukesha, WI: Southeastern Wisconsin Regional Planning Commission, March 1989), 3. ^ United States Census Bureau. “Grafton (village) QuickFacts.” accessed September 10, 2015, http://quickfacts.census.gov/qfd/states/55/5530000.html. ^ “Parks and Recreation,” Village of Grafton, accessed September 22, 2015. ^ Henning and Zaun, Grafton Wisconsin, 9. ^ “Aurora Opens Hospital in Grafton,” Milwaukee Journal Sentinel, October 31, 2010, retrieved September 16, 2015; Village of Grafton, Annual Report to the Citizens (Grafton, WI: The Village, 2012), 4, accessed October 2015. Henning, Donald S., and Ralph L. Zaun. Grafton Wisconsin: A History of the Place and the People. Grafton, WI: Zaun Memorial Foundation, Ltd., 2005. Lions Club. Grafton, Wisconsin: A Story of Industrial Progress. Grafton, WI: Lion’s Club, 1952.
van der Tuuk, Alex. Paramount’s Rise and Fall: A History of the Wisconsin Chair Company and its Recording Activities. Denver, CO: Mainspring Press, 2003.